I am a writer who has authored two books on the topics of smart shopping and wardrobe management. I’m also the creator of the popular “Recovering Shopaholic” website, an online resource and blog dedicated to helping those who struggle with Compulsive Buying Disorder. I started “Recovering Shopaholic” in January 2013 in an effort to heal my decades-long compulsive shopping problem. I was surprised and pleased to grow a committed readership within just a few short months. I feel tremendously blessed to have been able to inspire others to face their compulsive shopping problems and simplify their wardrobes. Although I stopped writing “Recovering Shopaholic” in early 2017, I resumed blogging in January 2018 with my new blog, “Full Life Reflections,” which centers on the pursuit of happiness, peace, and fulfillment in a chaotic world. It basically picks up where “Recovering Shopaholic” left off, as it’s dedicated toward how to create a fuller and more fulfilled life for those who have managed to pare down their wardrobes and spend less time, attention, and money on clothing and related items. In addition to writing about the common but often secretive subject of compulsive shopping, I’ve also written about many other topics related to personal development, including self-esteem, personal style and image, health, eating disorders, body image, time management, stress management, goal setting and achievement, relationships, and spirituality. Please visit my Archives Page for a partial list of my personal development articles. You may peruse my articles by category or browse the titles to see what interests you. 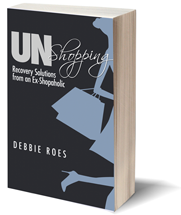 My first book, “UnShopping: Recovery Solutions from an Ex-Shopaholic,” contains the best of my smart shopping solutions from “Recovering Shopaholic,” fully enhanced and categorized into logical sections related to various shopping-related situations and challenges. 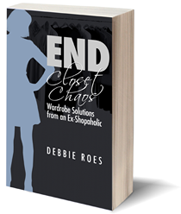 My second book, “End Closet Chaos: Wardrobe Solutions from an Ex-Shopaholic,” highlights the many wardrobe management tips and strategies that have been featured on my blog since its inception. Topics addressed include wardrobe size, closet organization, wardrobe tracking, and how to pare down your wardrobe. I also feature suggestions for taking care of your clothes, tailoring, packing for travel, and defining and enhancing your personal style. I plan to write additional books and develop online courses in the future. In addition to my personal writing and blogging projects, I also offer freelance writing and copy editing services. If you’re interested in learning more about how I can help you with your writing projects, please contact me. I hold a Master’s Degree in Counseling Psychology and am a Certified Professional Coach. I also worked in the high-tech industry for a number of years as a program manager, writer, editor, and web designer/developer. In my work as a coach, I helped clients with such diverse issues as weight loss, career transition, dating and relationships, and business growth. I also presented speeches to multiple corporations and associations on personal and professional growth topics, including stress management, managing change, goal-setting, weight loss, and time management. I was an active member of Pacific Beach Toastmasters for seven years and held a variety of leadership roles within that organization. I also served as the District 5 Webmaster for Toastmasters International for several years. I live with my wonderful husband of seventeen years, Mike, and our two adorable cats in San Diego, California. We love where we live and enjoy taking frequent walks along the bay or up the hill to view the ocean. On a clear day, we can see Catalina Island, where we were married on July 4, 2001! My hobbies include movies, walking, reading, photography, taking classes, attending personal growth seminars, learning new technology, cooking/baking, dining out, and exploring new areas.